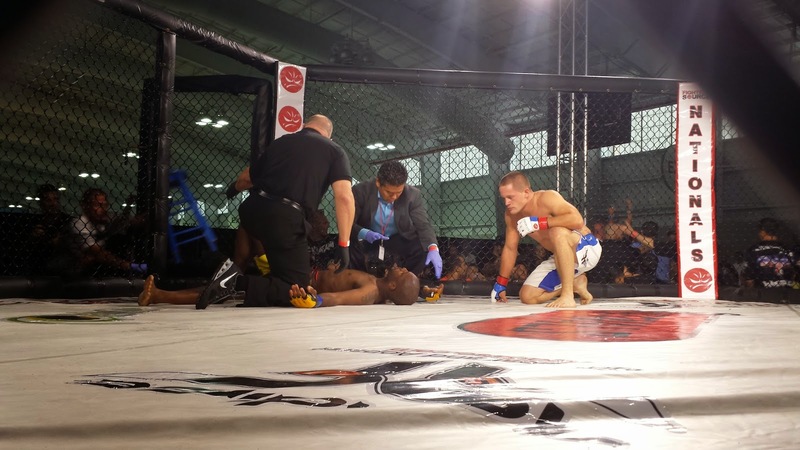 What happens when you put a bunch of amateur fighters in the cage at the Javits Center, fighters from all over the country who previously fought and won just to earn their spot on that New York City card? You get the Fighters Source 2014 tournament finals, which saw a slew of top-notch competitors shine, and punch their tickets to a trip to the UK and a bout against an elite amateur there. Sadly, no New York City-based fighters made the cut for that trip across the pond. But in the case of Stuart Gordon, at least he fell to an ultra-promising scrapper from Syracuse. That fighter was Josh Mayville, and based on what we've seen of him thus far, it would be smart to remember his name. Twenty-one seconds was all Mayville needed, and he would've held the record for the fastest finish of the night if not for the quick and accurate fists of Angela Hancock. Hancock caught opponent Suzie Wyatt-Walters moving forward with her guard down, and fed her a right that put her away in just eight seconds. A battle between reps from Colorado and Florida took a bit longer, with Adam Martinez and Will Calhoun beating each other silly in an affair that was pretty back-and-forth until a finish materialized near the end of Round 2. Meanwhile, with scores of cheering supporters (and what appeared to be his mother, crying tears of pride), Tom Farrel waged a short but furious war against Californian Mike Jenkins. For all of 51 seconds this one was a seesaw, but it ended via armbar - and Farrel tapping out. It may have been short on local fighters, but Saturday night's Fighters Source finals showcased some seriously high-level amateur talent from across the country. While much of the MMA world was home watching a UFC on FOX, those of us who came to Manhattan to sit around a cage set up in a cavernous convention hall were witness to a solid evening of fights.